The bare-chested fearless men in gloves, who much to our liking we see on television, delivering crosses and heavy blows on each other in the ring are our real pastime heroes. But, little do we know or think about what actually takes place behind the scenes. Boxing as we know is a Sport for the strong hearted and not to be taken lightly. Aspirants are suggested not to be too indulgent in their dreams of becoming a high octane boxer right from the beginning lest they miss a step , i.e. all those who are eager should not make the mistake of walking through the big door without any sound knowledge of what exists beyond it. In other words every fighter should start as an amateur as to boxing while building up the skills and steadily moving towards their goal. Before you make haste about making any move, take a moment and think upon what you will be getting yourself into. Life of a professional boxer let alone amateur, is not without risk. Every round of every fight is going to threaten your physical health. All the same, while physical injuries may heal up, any mental trauma associated with fights may end up being an unnatural cause of fear. So, if you think that walking around in the world of boxing is a cakewalk, You are mistaken! Like any other acrobat in the sports spectrum, boxers also need aggressive and focused training. If the trainee is a commuter he/she will have to maintain a separate schedule for their interest and follow it with regularity and intensity. When at the onset of training, it might seem hard to concentrate so in that case a little warming up to motivational music may seem like a good choice. Listening to an upbeat soundtrack prior to or while training may work wonders. While training day and night may seem addictive to it, nonetheless, walk hand in hand with your downfall. So as to say that, too much of anything and most of all boxing is not at all good for health. Because with each session of training your body adapts to its environment and what it is being taken through. So every now and then the body needs to replenish in every aspect and turning a blind eye to it, does not get you far. The first thing someone in training should do is familiarize him/herself with the norms laid out for Boxing. Be it the rules of fighting or what happens inside or outside the ring, every peripheral or core knowledge is essential to the boxer and should be prioritized; because knowing does half the work. Most of the time when beginners or even semiprofessionals lose a match or face other problems related to boxing, it turns out to be their own carelessness pertaining to whatever might have been necessary to be taken into account. Deserving of special mention is the thing, without which any solemn undertaking cannot run for too long – FOCUS. This will be the prima facto while you are training and even when you are taking care of other things, running household errands etc. The pillar of focus should be so strong that it does not go off base, no matter what. Simply saying, focus is going to be the one catalyst that will ensure the success of your endeavor. As mentioned earlier, it is quintessential to have sound knowledge about the world of boxing before you can get a handle on the situation. It is just as imperative to be well informed as it is to train hard without looking back since boxing is not a brute sport ; it takes much brain to plan moves and take control over the situation as the physical effort is needed to put into each day of training. Since boxing is not without risk, it is of primary concern to the fighter that he/she takes special care of health. Firstly, aspirants, without a sound record of health will not be allowed to become a member of boxing. Secondly, it is of utmost importance that once registered, the trainee pays vigorous attention to the trainer as a few words of advice spare a long term damage. Lastly, one has to take good care while moving onto professional boxing from amateur boxing since there are vital differences in terms of safety in the two versions of the sport. It is important to shut the disturbance out while in training, it is crucial that the trainee builds up the right mentality and understands the fad of the day. Answering the call of the fans is just as necessary as keeping confidence in yourself because even a little cheer from the crowd can lift your spirit by leaps and bounds. It is to be remembered that much of your fame has to do with the image you choose to put in front of the crowd. It goes without saying that making an impression is pivotal to every aspect of life let alone boxing. A boxer in training will do well to keep a good conduct and moral record from the early days as it always helps in winning the trust of the people in and outside the ring. Moreover, boxers without a clean record of moral conduct are not allowed in professional boxing. Often boxers in the making get theirs spirits high by keeping unrealistic expectations from this avenue. Because often it happens that fighter in pursuit of dreams blown out of proportion fall hard on their back. So it is wise to cut the cloth according to your size. Do not set out with your eyes on the big prize rather work your way up the ladder as humbly as possible. Habits that stand between you and your dreams should be eradicated immediately. Habits like smoking, drinking, drug addiction are to be avoided if you are interested in realizing your plans and ambitions with regard to becoming a fulltime boxer. More so, sometimes it is easier said than done, so it is always important that the trainee is in an ambiance that encourages good habits which is always better than a forced option. It is to be taken into account that it is essential to bud a caring relationship with your trainer so much so that he/she prioritizes you and sees you in a different light than others. Changing the trainer into your mentor is a vital step in securing the best results from your training. Remember, basking in the parental love of your trainer can put you a mile ahead of others under the same trainer who have failed to tap his/her softer side. Speculating and then ascertaining what is best for you in the ring is a good plan to stick to. When you are coming to know about all the corners of boxing with its ebbs and flows it is a wise step to test yourself on everything. By doing this, not only you can completely comprehend the basics of boxing but also find out your strong suit. For example it may turn out that no other trainee in your gym can deliver a hook as effectively as you do. This is the simplest step in order to be efficiently updated on your competitors. Keep a close eye on those who train with you as to their strong and weak attributes. Because once you have sized up your opponent, putting a finger on the match is not as hard anymore. Nevertheless, it is not always possible to keep track of everything happening in the boxing arena so it is agreeably smart to sign up for warm-up, sparring matches to be learning a thing or two from. Since in professional boxing the maximum number of rounds to be played is twelve, it involves a huge usage of stamina on the part of the fighters. So it is crucial that the fighters keep themselves in the habit of friendly matches from as early as the days of amateur boxing. This kind of continual sparring can help the fighters grow endurance, not to mention be agile without losing too much energy. Regardless of the solid training support you must be getting from your trainer and peers, it is unarguably important to have an emotional support system that will finally help you stand in your zeal and passion for the sport. Be it your family or someone else, it is of indispensable importance to have someone who will put a sympathetic ear to your tale of woes and slowly help you recover from any type of trauma. Another vital point to remember is to have the sense to give up before you give out. The sooner you learn that one who is wise enough to leave the ring to fight another day is the gainer, the better. Because very often the boxer is likely to make a wrong call out of ego. So it is essential to hone your mind on being in control in the most difficult and tempting situations. No matter how big or famous a boxer you are, you will have to keep in mind to respect your adversary. Because giving your opponent a fair fight is all about respect. Looking down on your opponent might not be such a good idea because it is bound to send out the wrong signal among the crowd. The audience however come to see matches to give vent to their stress and it may happen that quite a few number of them are having the same problems of having looked down upon as the other fighter. And you will immediately lose a step with that attitude. Keeping your spirits high at all times inspite of all the minor hurdles that will fall along is essential. Because in contact sports such as boxing, it is quite common to suffer injury during a friendly sparring and this only to be taken as a lesson and not as a reminder that someone just sent you back to school. Plus losing matches do not determine the lacuna of the fighter; it only emphasizes the need to train harder only to see a better day in the ring. There is nothing more assuring than knowing your abilities. Your trainer no matter how well he/she understands you, cannot make your decisions for you. So in your formative years you will have to go out of your way to discover your talents with regard to lasting the twelve rounds in the ring, not to mention winning. For example the matter of choosing between inside and outside or ambivalent boxing, brings the ball in your court if you know yourself. 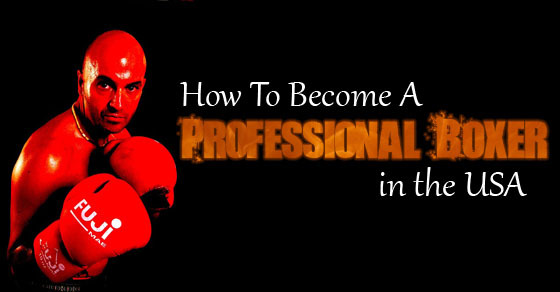 Rest assured, becoming a professional boxer in the USA or any other part in the world for that matter can be very demanding since one has to be continually in training regardless of his/her everyday life affairs. Nonetheless, once across the initial shortcomings it becomes quite an enjoyable let alone lucrative sport if one puts his/her heart and mind into it.